This book provides a description of the generalized two layer surface complexation model, data treatment procedures, and thermodynamic constants for sorption of metal cations and anions on gibbsite, the most common form of aluminum oxide found in nature and one of the most abundant minerals in soils, sediments, and natural waters. The book provides a synopsis of aluminum oxide forms and a clearly defined nomenclature. Compilations of available data for sorption of metal cations and anions on gibbsite are presented, and the results of surface complexation model fitting of these data are given. The consistency of the thermodynamic surface complexation constants extracted from the data is examined through development of linear free energy relationships which are also used to predict thermodynamic constants for ions for which insufficient data are available to extract constants. The book concludes with a comparison of constants extracted from data for sorption on gibbsite with those determined previously for hydrous ferric oxide (HFO), hydrous manganese oxide (HMO), and goethite. The overall objective of this book is the development and presentation of an internally consistent thermodynamic database for sorption of inorganic cations and anions on gibbsite, an abundant and reactive mineral in soils, sediments, and aquatic systems. Its surface has a high affinity for sorption of metal cations and anions, including radionuclides. The gibbsite database will enable simulation and prediction of the influence of sorption on the fate of these chemical species in natural systems and treatment processes in which aluminum oxides are abundant. It thus will help to advance the practical application of surface complexation modeling. ATHANASIOS K. KARAMALIDIS is a Research Assistant Professor in the Department of Civil and Environmental Engineering at Carnegie Mellon University. He has conducted research on the dissolution and surface reactions of complex mineral assemblages in aqueous systems. He has published his work in peer-reviewed international journals in environmental engineering and science, and in the proceedings of international conferences. DAVID A. DZOMBAK is the Walter J. Blenko Sr. Professor of Environmental Engineering in the Department of Civil and Environmental Engineering at Carnegie Mellon University. He is also Faculty Director of the Steinbrenner Institute for Environmental Education and Research. He has published numerous articles in leading environmental engineering and science journals, book chapters, articles for the popular press, and has authored two books. CHAPTER 1 - Aluminum Oxides and Hydroxides under Environmental Conditions. 1.1 Occurrence of Aluminum Oxides and Hydroxides in the Subsurface. 1.2 Occurrence of Aluminum Oxides and Hydroxides in Surface Water. 1.3 Use of Aluminum Hydroxide in Water Treatment. CHAPTER - Formation and Properties of Gibbsite and closely-related minerals. 2. Formation and properties of Gibbsite and closely-related minerals. 2.2 Formation of Gibbsite and Other Al-Hydroxides and Oxyhydroxides. 2.3 Aluminum Hydroxide Polymorphs: Structure and Nomenclature. 2.8 Other forms of aluminum oxides and oxyhydroxides. 2.9 Other forms that manufactured under high temperature and pressure. CHAPTER 3 - Types of Available Data. 3.4 Cation and Anion Sorption Data. 3.5 Spectroscopic Data for Sorption on Gibbsite. CHAPTER 4 - Data Compilation and Treatment Methods. 4.2 Assessment of Data Quality. 4.3 Compilation of Surface Properties. 4.4 Extraction of Equilibrium Sorption Constants. 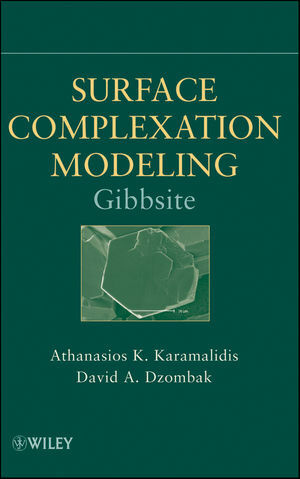 CHAPTER 5 - Surface Properties of Gibbsite. 5.3 Point of Zero Charge. 5.5 Effects of Dissolution on Gibbsite Surface Acid-Base Chemistry. CHAPTER 6 - Cation Sorption on Gibbsite. 6.1 Modeling Methodology and Reactions. 6.2 Available Spectroscopic Data and Use in Modeling. CHAPTER 7 - Anion Sorption on Gibbsite. 7.1 Modeling Methodology and Reactions. 7.2 Available Spectroscopic Data and Use in Modeling. CHAPTER 8 - Coherence and Extrapolation of Results. 8.1 Cation Sorption on Gibbsite. 8.2 Anion Sorption on Gibbsite. 8.3 Comparison of Gibbsite surface complexation constants with those of Goethite, Hydrous Ferric Oxide and Hydrous Manganese Oxide. APPENDIX A. Summary of Experimental Details.